If you are representing yourself, you must fill out all the forms. The clerk of the district court cannot help you fill out any legal forms. These forms are meant to help people with a “simple” modification. A “simple” modification is one where both parties agree that custody and/or the parenting plan should be changed. If the parties do not agree that custody and/or the parenting plan should be changed, you need a lawyer. If you do not have enough money to hire a lawyer, there is another option. You can hire a lawyer to handle only part of your case. This is called Limited Scope Representation. To find out more about Limited Scope Representation click on this link: https://supremecourt.nebraska.gov/limited-scope-representation or here http://nefindalawyer.com/. A new parenting plan that provides for any change in custody or parenting time. The court may also change child support and the responsibility for health care expenses and childcare expenses. You start by filing a Complaint for Modification. You file the complaint with the clerk of the district court in the county where the original order was entered. There is a cost to file a Complaint for Modification. You must notify your child’s other parent that you have filed a Complaint for Modification. Responsibility for health care expenses and childcare expenses. Parenting plans may be modified if there is a “material change in circumstances.” This means something happened that, if the court had known about it at the time of the original parenting plan, would have persuaded the court to rule differently. At a final hearing, the parents will have to explain to the court their reasons for changing the plan. The court must find that the proposed change is in the best interests of the child. You and your child’s other parent must sign the parenting plan. In Douglas County, you may have to get the parenting plan approved by the Conciliation Court Office in the Hall of Justice, before you can schedule a final hearing. You may have to complete a parenting class. You may have to go to mediation. You may have to give the court a Financial Affidavit for Child Support and a proposed Child Support Calculation (if necessary). Click on this link for a complete list of forms and instructions on how to complete the forms. What must you file with the clerk of the district court to get a parenting plan modified? The judge’s Order is filed with the clerk of the district court. Confidential Employment and Health Insurance Information and Social Security/DOB/Gender forms. The filing fee.You must pay a filing fee at the time you file the complaint for modification.The clerk will tell you how much this is. The clerk of the district court will re-open your old file. Voluntary Appearance. The other party can accept service by signing a voluntary appearance form. Here is what you do. Follow these Instructions to complete the Voluntary Appearance form. Give the other party the Voluntary Appearance form and a copy of the Complaint. Have the other party sign the Voluntary Appearance form and either return it to you or file it with the court. The other party keeps the copy of the Complaint for Modification. File the signed Voluntary Appearance form with the clerk of the district court, unless the other party has already done so. Praecipe for Summons. You can have the other party served by the sheriff. When you live in the same county as the other parent, here is how you do it. Follow these Instructions to complete the Praecipe (pronounced “pray-si-pee”) for Summons. File the Praecipe for Summons with the clerk of the district court where you filed your Complaint. Call the clerk or local sheriff to find out how much it costs to have the sheriff serve the other party. Take a money order for this amount made out to the sheriff with you when you file the Praecipe. If the court granted your Application to Proceed In Forma Pauperis, you do not have to pay this fee. The clerk will write up a Summons. Then the clerk will send the Summons, Complaint and money order to the sheriff. The sheriff will try to serve the other party with the Summons and Complaint. This is an example where each district court may have specific local rules. Check with the clerk of the district court in your county to be sure this is the way the county that you filed in gives the Summons to the sheriff. The Summons tells the other party that you have filed the Complaint and when the other party must file an Answer. Does it make a difference if the other party and I live in different counties? Call that sheriff’s office for the county where your child's other parent lives. If the court approved the Application to Proceed In Forma Pauperis, ask the sheriff’s office if they will serve the papers without payment in advance. You will mail the Summons and a copy of the Complaint to the sheriff for the county where your child's other parent lives. Include a letter explaining to the sheriff that the Summons and a copy of the Complaint must be personally served on the other party before the "return date" on the Summons. The sheriff will try to serve the other party. The sheriff will return documents to you with a "return of service." The return of service will state whether the other party was served. You must file this paperwork with the court, even if the other party was not served. What Happens after the Other Party is Served? The other party has 30 days after being served to file a written response to your Complaint. The written response is called an “Answer.” (If the other party signed a Voluntary Appearance, the 30 days begin to run the day after the Voluntary Appearance is filed with the court.) The other party does not have to file an Answer, but is entitled to do so if the other party so chooses. You cannot ask for a final hearing until after these 30 days have passed. If you are the responding party in this case for Modifiction of Parenting Plan, you can file an Answer and Counterclaim for Modification of Parenting Plan (DC 6:15(6)) using the Instructions for Completing the Answer and Counterclaim for Modification of Parenting Plan (DC 6:15(6a)). After you have signed the original Answer and Counterclaim for Modification of Parenting Plan, you must file it with the clerk. Make sure to fill out the information requested in the Certificate of Service at the bottom of the last page of the Answer and Counterclaim and sign the Certificate of Service before you file the original Answer and Counterclaim with the clerk of the district court. Make two copies of the Answer and Counterclaim for Modification of Parenting Plan after you have signed it but before you file it with the court. Send one of those copies to the other party by first-class mail, and keep the other copy for your files. You and your child’s other parent draft a new parenting plan. You can do this on your own using the sample parenting plans on the website. You can ask for the help of a parenting mediator. Or you can ask for the help of a lawyer. (See the resources above). Both you and your child’s other parent must sign the parenting plan. You ask for a final hearing date. Ask the clerk of the district court how to get a hearing date and time. You cannot ask for a hearing date until 30 days have passed from the date of service. Getting Ready for the Final Hearing. You must sign the original Notice of Hearing and file it with the clerk. Make sure to fill out the information requested in the Certificate of Service at the bottom of the Notice of Hearing and sign the Certificate of Service before you file the original Notice of Hearing with the clerk of the district court. Make two copies of the Notice of Hearing after you have signed it but before you file it with the court. Send one of those copies to the other party by first-class mail, and keep the other copy for your files. If a change in child support is requested, Prepare financial information for child support. The court must decide how much child support should be ordered, if any. 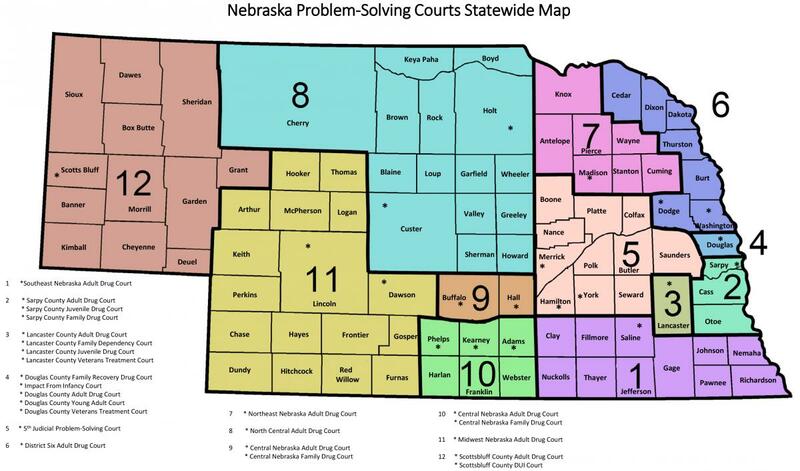 The courts use the Nebraska Child Support Guidelines to figure out how much support to order. If you want the court to figure out how much child support to order, complete the Financial Affidavit for Child Support using these Instructions. Complete a new parenting plan. You can develop your own parenting plan or use one of the following parenting plans as a guide. For use when both parents voluntarily and willingly agree to share joint legal and joint physical custody. Joint legal custody means mutual authority and responsibility of the parents for making mutual fundamental decisions regarding the child(ren)'s welfare, including but not limited to choices regarding education, health, and spiritual or religious upbringing. Joint physical custody means mutual authority and responsibility regarding the child(ren)'s place of residence and the exertion of continuous parenting time for significant periods of time. For use when both parents voluntarily and willingly agree to share joint legal custody and one parent will have sole physical custody. Sole physical custody means authority and responsibility lies with one parent only regarding the child(ren)'s place of residence and the exertion of continuous parenting time for significant periods of time. For use when one parent has sole legal custody and sole physical custody. Sole legal custody means the authority and responsibility lies with one parent only for making fundamental decisions regarding the child(ren)'s welfare, including choices regarding education and health. For use when one of the parents plans to seek full custody and the noncustodial parent has failed to cooperate in creating a new parenting plan. Fill out the Order. Fill out an Order for Modification of Custody or Parenting Plan using these Instructions. Finally, prepare what you are going to say in court. The “Instructions for your Modification of Custody or Parenting Plan Hearing” includes a script you can use at the final hearing. You do not have to use this script. If you do not use the sample script, write out ahead of time what you want to say. Read the sample script or the script you prepared when you go to court. Practice what you want to say before you go to court. The sample script or your script. Ask the clerk of the district court how to let the judge know you are there for the hearing. The judge will come into the courtroom. Stand up when the judge comes into the courtroom. The judge will read your case name and number out loud. There will be a court reporter taking down what everyone says. Tell the judge you are ready to present your case. Ask the judge to swear you in as a witness. The judge will place you under oath. Testify about the facts in your complaint. Once you have testified the judge will decide whether the Order you prepared is done correctly. If the judge signs the Order it means the judge has entered an Order of Modification. The judge usually will tell you on the day of the hearing whether the Order will be signed. If the judge signs the Order, the judge also will sign the copies of the Order and give them to you. One copy is for your records. The other copy is for your child’s other parent. If you want an official (“certified”) copy of the Order, ask the clerk of the district court for one. There will be a cost to get an official copy of the Order. If you do not go to the hearing your case will be dismissed. Then you will have to start over again. If you know in advance you cannot make the scheduled hearing, call the court to reschedule the hearing.